DENSO is a market leading brand in industrial sealing and coating, providing sites, tradespeople and the more serious DIY enthusiasts with highly durable, non-corrosive solutions for their piping, cabling, rods or fittings. 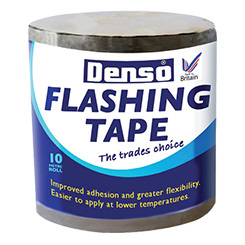 DENSO benefits from decades of experience as the UK's leading sealing tape, and its corrosion resistance is the product of years of improvements and upgrades as the associated technology and trends have progressed. Perfect for use on pipes, valves, structural steelwork, concrete tanks and many fittings, it provides sure-fire protection, even in extremes of cold and heat. With a wide range of tapes and primers for a similarly wide range of uses and applications, DENSO TAPE is cold applied, simple to use and will last for many years - its synthetic fabric, coated and saturated with petroleum, makes light work of sealing the majority of piping material. They are highly resistant to any mineral acids and alkalis that may be produced from these materials, and they are similarly resistant to any water, steam and gas that may be transported or produced from within the pipes. Whether you have some exposed cabling that needs protection or some serious issues with piping corrosion, DENSO has you, and your piping, covered.